Psoriasis is a skin disease which is caused by a problem in the immune system. When it occurs, the newly formed skin cells rise to the surface faster than they normally should. Psoriasis usually shows up on elbows, knees, scalp, back or face, but is not restricted to these areas. This disease lasts for a long time in some people. Research shows that persons with psoriasis have a higher risk of getting diabetes, high blood pressure or metabolic syndrome. Triggering factors for psoriasis include high stress, allergies, alcohol, cold or dry weather, tattoos, some medications, infections and smoking. Sometimes it runs in families. 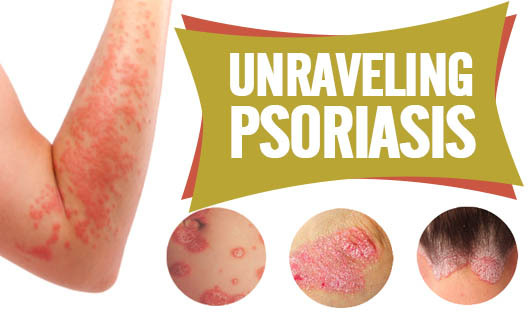 Psoriasis can be treated with medications, topical applications and/or phototherapy. Lifestyle changes, omega 3 supplements, vegetarian diets can help to improve symptoms. Meet with your doctor if you see unusual changes on your skin. Do not self-medicate or seek advice from unqualified professionals.